Canyon Lake native, Shelley Cobb, experienced one of the worst – and one of the better — moments of her life last summer. Her worst was when a motorcycle accident left her with significant disabilities caused by a traumatic brain injury. However, that was followed by a better moment when she recovered enough to attend her daughter Renay’s wedding – which was held at New Braunfels Regional Rehabilitation Hospital, where Cobb was receiving treatment. After six weeks of treatment and therapy at the hospital, Cobb sat in the front row and watched Renay walk down the aisle. She even danced a little during the reception. “It’s a day I’ll always be thankful for,” she says. Cobb is one of numerous patients who have received rehabilitation at New Braunfels Regional Rehabilitation Hospital following a brain injury. The hospital recently became the first in New Braunfels to earn The Joint Commission’s Gold Seal of Approval for brain injury rehabilitation. Certification is voluntary and given after a rigorous on-site review of the hospital’s practices, programs, and outcomes in treating brain injury patients. 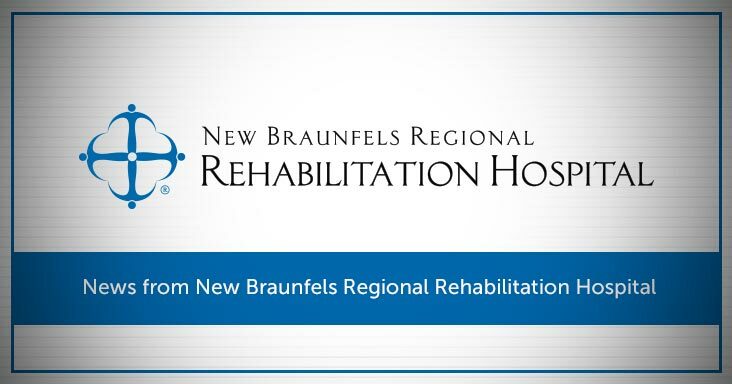 At New Braunfels Regional Rehabilitation Hospital, a multi-disciplinary team provides treatments that include physical, speech and occupational therapy; dysphagia management; brain injury education; neuropsychology counseling; home evaluations; caregiver training; home health services; community reintegration; and more. Lomba says that an important part of treatment for all brain injury patients is community reintegration. This is where patients are put in real-life situations under the guidance of healthcare professionals so they can learn to successfully navigate everyday situations and be prepared when they are on their own. When Cobb was a patient at the hospital, a large part of her community reintegration treatment focused on activities to prepare for her daughter’s wedding. In addition to wedding-related activities, the hospital staff also took Cobb to a grocery store as part of her community reintegration. There, she shopped from a list to practice for when she returned home. Before she was discharged, the staff also evaluated her house to ensure her safety.